Thanks to the Sunday New York Times. And assuming you subscribe and have home delivery. 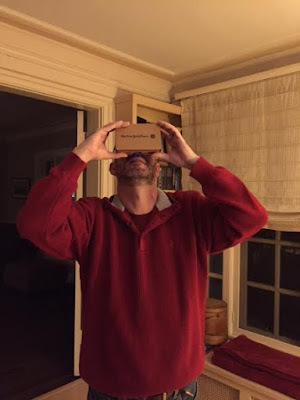 In this last week's Sunday edition, came a cardboard box that allowed you to insert your iPhone and venture off into the world of virtual reality. As long as you downloaded the app, of course. I don't know why it says it takes you halfway around the world. Depending which direction you go, I think you can go all the way. Kind of. There are different programs from which to view. The big one is a VR film Displaced about children uprooted due to war. I suppose it is the right thing to say that is what you're actually using the device for. You can also travel to other cities. I'm likening this part to be somewhere between a GAF ViewFiner and Google Street View. Say you're in Venice, you get a 360 view of the one place whomever took the picture is standing. It's nice. It's clear. But there are quite a few more square miles of city you'll never see this way. However, unlike Street View, you can look up at the sky, or tops of buildings, or you can look down at the walkway or street. Personally, I had a lot of trouble not being able to click on the New York setting. It would skip right past Venice to Rome, even though NYC was next in line. And I tried about two dozen times. It wasn't there for me. 710 must have seen it, because he commented on it. There are also ways to see a 3-D kaleidoscope. And you can be at the Smithsonian to see dinosaurs and the Enola Gay and a Space Shuttle. All very cool. Some very close up. You do have to recalibrate your equilibrium a bit. The device and some of the programs throw off your sense of balance a little bit. And it's not horrible easy to use while using glasses. That is something someone will have to work on - though Google and the NYT did a decent enough job on one size fits all for the 1.7 million folks who received one of these devices. I tried without glasses, but I'm blind enough to not get clear images - even that close up. Of course, I'm hoping someone will add to the app, or other apps, where you're flying, or having a speeding train come right at you or some such activity. Maybe there are other apps out there already. I haven't looked. But at least we now have the device to play with our reality. Finally! They've been promising us virtual reality for like 20 years. 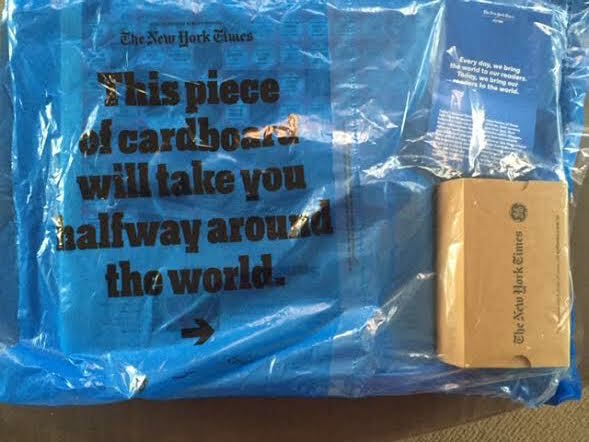 Is it possible to get one of these if you're not a NYT subscriber? I don't have your direct email address, so hopefully you'll check back here. But Gooogle it. I don't know if Google, who provided the glasses, has an option to get a pair. I have to believe someone out there would give theirs away.